South Sudanese authorities on Friday released two former high-ranking followers of rebel leader Riek Machar who were facing death sentences. President Salva Kiir’s government had imprisoned former Machar spokesman James Gadtet and former Machar security adviser William John Endley on charges of treason and conspiracy. The two men were smiling and appeared to be in good condition as they were released by guards at Juba National Security Headquarters. Interior Minister Michael Chienjek said, "Their release comes as part of the peace [agreement] implementation." The Sept. 12 agreement requires the parties to release all political detainees and prisoners of war. Kiir said his administration was checking to see whether there were more detainees to be released. 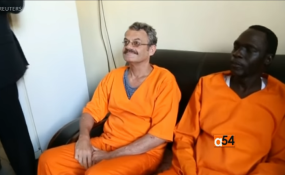 Chienjek said he expected Gadtet to travel to Khartoum and that Endley would be deported to his native South Africa. Security officials in Kenya arrested Gadtet two years ago and sent him to South Sudan. Endley was arrested in Juba in August 2016, days after government forces and Machar's bodyguards renewed fighting. Both men were first sentenced to 20 years in prison, then later were sentenced to death by hanging. Gadtet said he was happy to be free after two years in prison. "I think this the same day I was arrested in Nairobi — on the 2nd of November 2016 — and today is the 2nd of November 2018,” he said. “I want to thank President Salva Kiir for ordering my release. I am very happy that this will enable me to reunite with my family." Endley said he was thankful for the hospitality of the South Sudanese people. "Unfortunately, in all walks of life in all countries, you will get the good people and the bad people, and my memories of South Sudan always will be positive," he said. James Gatluak, a relative of Gadtet, praised the president for releasing Gadtet but said more political prisoners must be freed. "I am very, very happy. I am thanking President Salva Kiir for the release of James Gadet, and I also thank Dr. Riek Machar for bringing peace to South Sudan,” he told South Sudan in Focus. “But still we have people we want: lawyer Dong Samuel and Aggrey Idri. We want these two people also [to] be released." Seif Magango, deputy director of Amnesty International East Africa, the Horn and the Great Lakes, welcomed the release of the two men but also said more must be done. "It is a relief that two lives have been spared,” he told South Sudan in Focus. “They were at risk of the death penalty, but that will not happen as a result of the pardon that was given. But that is not the end of it. There needs to be a proper end to the use of the death penalty. All people who are on death row need to be commuted so that no one in South Sudan is executed by the state."